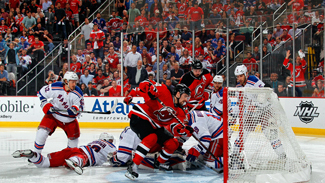 NEWARK, N.J. -- The immediate future of the New York Rangers will be one filled with angst and regret after having their season end Friday night at the hands of the New Jersey Devils. But way beyond the horizon, things look pretty hopeful to coach John Tortorella. "I love our jam," Tortorella said. "I love our [intestinal fortitude]. I really like what we have here." The Rangers entered the 2011-12 season as a young team that was lacking in both experience and success. In Tortorella's first two full seasons with the club, the Rangers missed the playoffs in 2010 and backed into the postseason last year only to lose in five games in the first round. The Rangers made a leap this season, pushing themselves to within two victories of a trip to the Stanley Cup Final before losing 3-2 in overtime to the Devils in Game 6 of the Eastern Conference Finals at Prudential Center. The Rangers ran away with the Eastern Conference to claim the top seed, then displayed the resiliency and toughness that became hallmarks of a club that lacked both things for a very long time. Facing a 3-2 series deficit to the Ottawa Senators in the first round, the Rangers rallied to win Game 6 on the road before winning Game 7 at home. In the second round, the Rangers won yet another Game 7, this one against Washington, to reach the conference finals. They erased a two-goal deficit in Game 6 against the Devils before falling in overtime after overcoming a three-goal hole in Game 5 at home two nights earlier. "We played 20 playoff games. We played a couple of Game 7s," Tortorella said. "We've been in situations where we've had to scramble to win a series. I thought there were some really good things with some players and how they handled themselves, and I think there were some struggles with other ones. These are the evaluations you go through as you gain experience. "We're still a young club. We still have quite a bit to learn as far as the desperation, when you get to this third round. I just don't want us to -- and you hear it so much, and I won't accept it. You know, you won a couple of rounds. You got into the third round. That isn't good enough. We still have to find a way to win another round and get there." With the way the Rangers are structured, the core group should have plenty of opportunities to move past the third round in the coming years. The Rangers are the ninth-youngest team in the NHL, filled with homegrown players who have developed together through the AHL. According to capgeek.com, they have 14 players under contract for next season with defenseman Michael Del Zotto as a restricted free agent. Marian Gaborik, Brad Richards, Ryan Callahan, Marc Staal, Dan Girardi and Henrik Lundqvist all are signed through at least 2013-14, while budding star Ryan McDonagh is locked up through 2012-13. Even after watching Adam Henrique's goal end their season 1:03 into overtime, the Rangers could see the promise that lies ahead in the coming years. "The way we battled, with the character with the guys in this room, it's next to none," Staal said. "All playoff long, we were resilient. It makes it that much harder to swallow when you lose a game like this." "It's the way our team has been all year," McDonagh said of coming back from down 2-0 in Game 6. "Great character in our room and our leaders, they never gave up. " It wasn't all peaches and cream for Tortorella, though. He didn't call out anyone specifically when asked about how his young players performed, but rookie Carl Hagelin clearly underachieved -- after registering 14 goals and 24 assists in 64 regular-season games, he had only three assists in 17 postseason games. Hagelin was also on the ice for the Devils' winning goals in Games 5 and 6. "There were a lot of momentum swings and surges, and the best thing is that you need to experience those," Tortorella said. "We didn't finish the way we wanted to. But some guys handled them very well. I'll be honest with you, some guys didn't. And those are the things we have to talk about as an organization if we're going to continue to try to get better. "I just don't want this organization to sit still and say, because, prior, it was barely getting into the playoffs, losing in the first round, maybe getting to the second round. We have to change our mindset to continue trying to be the best and learn that there's a lot more hockey to play after you go through a couple [rounds]."